It's not too late to read this month's copy of Go Local Magazine. Features include the Nerac Cycling Club, hitting the road this month for the 5th Annual Seven Lakes Ride; Wilbraham's Fountain Park and the revived Peach Blossom Festival; Ellington's 16-acre Kloter Farms and Ice Cream Barn; the Agawam Bowmen's Club, the oldest archery-only organization in Western Mass. ; and Second Chance Equine Rescue in East Granby, CT. There are recipes for 3 Simple Summer Sippers from yours truly and a list of 7 "Strawberry Pick-Me-Ups" to help you celebrate the beginning of berry season. And of course, in every issue, Go Local Picks, Go Explore, In the Garage, and so much more. Pick up a free copy at one of our Go Local businesses or read it online now. Link to individual articles straight from the home page or in the featured articles tab! Find out where you can pick up your free copy! Use ISSUU to read the current issue or past issues! Check out the all-new Recipe Archive! So, I repeat...CHECK IT OUT NOW! As part of the Taste of Manchester 2017 Marketing Committee, Amy has volunteered to write short features on the participating restaurants and share them via our blog here.This year's Taste of Manchester will be held on Tuesday, May 9th from 5:30 to 9 p.m. See the TOM webpage, Facebook page, or Twitter @TastyTownCT (#TOMCT2017) for more information. For years now, my neighbors and I have bemoaned the fact that Downtown Manchester was lacking a decent coffeehouse. Main Street is brimming with breakfast joints, but once mid-afternoon comes and they close for the day, there's nowhere to sit and work or meet a friend over a good, non-corporate cup of joe. Enter Silk City Coffee, the answer to all of Manchester's caffeine-withdrawal-induced prayers. 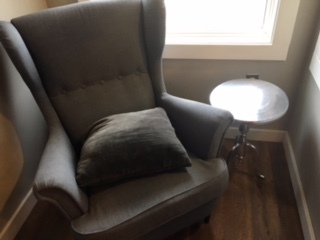 Located right in the middle of Main Street (#763, to be exact), this cozy, small-town coffee shop opened in the fall of 2016 and has been going strong ever since. High school sweethearts who are now married, Sarah and Rob May manage the shop and own it along with business partners Tammy and Glenn Gerhard, who were the couple's guidance counselors and mentors. Talking one day about their feeling of dissatisfaction with their jobs, the Gerhards asked the Mays if there was anything they could be doing, what would it be? The Mays imagined owning a small coffee shop, and the four of them decided to make it happen. The shop offers a variety of coffee/espresso drinks and high quality teas, as well as a hot chocolate that is to die for. 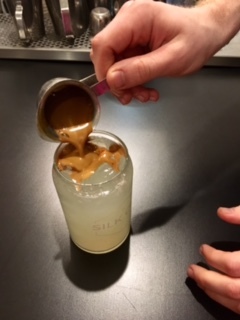 They come up with some creative seasonal drinkss as well, like this summer's strange-sounding yet refreshing and zippy "Espresso over Lemonade" (trust me, it incredibly good). 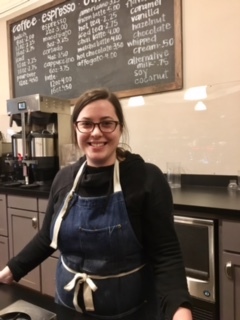 Sarah is the shop's baker, and the place has become well-known in town for their incredible cinnamon buns. They also have a small lunch menu and plenty of other specialty treats like cookies and pastries, all made from scratch, in house. The Mays have always loved to entertain, and now, Sarah says, "It's fun for us to have the whole town over!" 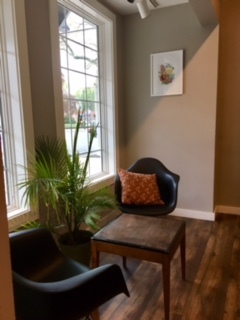 The cozy space, with tables, counters, sofas and comfy chairs, is perfect for a first date, a work meeting, or just a place to read a book and have a cup. Better yet, the Mays and Gerhards share a community-driven vision. 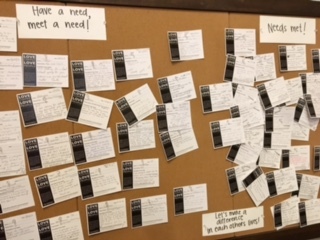 In the back of the shop is the "Needs Board" featuring dozens of notes in which people state their needs and neighbors respond. 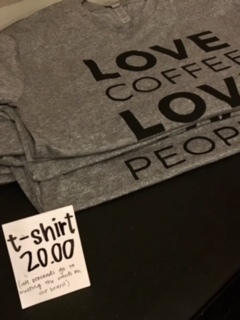 The profit from t-shirts on sale in the shop go toward meeting these communal needs as well. Sarah says they chose Manchester because they "fell in love with the small-town feel." And there's no better way to experience that feeling than by attending the annual Taste of Manchester which is on Tuesday May 9 from 5:30-9. 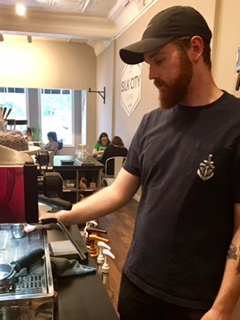 Silk City Coffee will be supplying participants with tastes of their batch brew, housemade chai and hot chocolate, with a mini-chocolate chip cookie on the side. Yummmmm.....!!! 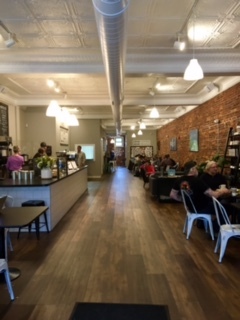 Silk City Coffee's summer hours are Monday-Wednesday 7 a.m. to 6 p.m., and Thursday-Saturday 7 a.m. to 8 p.m. They occasionally host live music nights as well. They can be found on Facebook and @silkcitycoffee on Instagram. At first, I thought it was a scam. Around Christmas, my mother had sent me a sweepstakes link on Facebook, and on a whim, I entered it. A few weeks later, an email arrived, informing me that I had won. The prize was a 3-night stay at the country-inn-turned-writer's-retreat When Words Count Retreat in Rochester, Vermont. The stay would be my prize; I had to pay for the "gourmet meal service." If you're reading this, you know I don't mind paying for good food, so after I poked around the Internet looking for proof that this was a real thing, I called and booked my reservation. I figured it was a small price to pay for food when I'd have a long, quiet weekend to myself to work on my writing. To say I was right would be an understatement. I could write a whole post about what an incredibly positive, possibly life-changing experience this one weekend retreat was for me. I arrived as a blog writer with a few articles published in some local magazines. By the end of my second day in Vermont, I had written almost 3,000 words of what I'm hoping will be my first book. The environment was ideal. The setting was inspiring. The schedule was accommodating. The discussion was stimulating. I really do want to go on. This costs $60 per day plus a 17% service charge which covers both gratuity and VT sales tax. I think I should say a mere $60 per day, because I found this to be an outstanding value for what I received, considering at most upscale restaurants where I live, I could easily spend that on a four-course dinner alone. Here is one of my breakfasts, and yes, I mean both pictures constituted one breakfast: a bowl of creamy, tangy vanilla yogurt topped with crunchy granola and fresh berries, accompanied by scrambled eggs, thick country-style bacon, and strawberry-rhubarb-stuffed French toast. Are you drooling yet? Because recalling these meals is making my mouth water all over again. Coffee and tea service was available all day, and we had a cocktail hour before dinner during which we were offered cheese and crackers, crudites, and the like. Needless to say, none of us went hungry that weekend. And I haven't even gotten to the dinner course. So here's the teaser - my next post will focus on dinner alone, and will include at least one recipe. So check back soon! And writers? Check out When Words Count Retreat. You won't regret it. Spring is here and it shows in this month's issue of Go Local Magazine. April's features include articles on local arborist Laura Mele, Chef Franny Krushinsky of Longmeadow, Stafford's newest business the Stafford Cidery, the "lamb ladies" of Pine Knob Farm in Somers, and a sneak peek inside Route 83's architectural wonder Aborn Castle. You can also read about disc golf at Crane Hill in Wilbraham and the good work being done by the Jeff Braun Memorial Foundation. 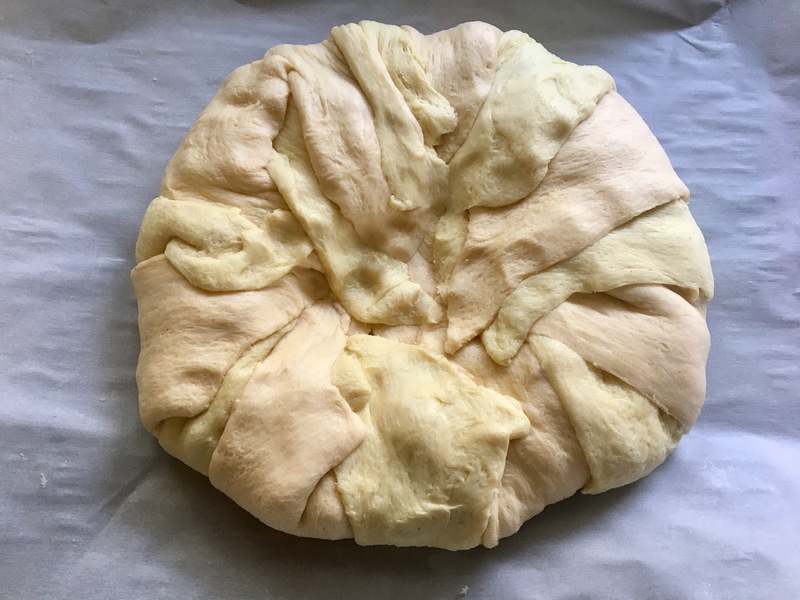 Find out about local products, CSAs, how to make A Couple in the Kitchen's award-winning Quiche Caprese, and the great eats at Stir the Pot in East Windsor. There are suggestions for springtime hobbies good for the whole family, places to find local herbs and mulch, and a list of community theatre groups. Find all this and more online here or by picking up your April issue at your favorite local business - it's free!!! Taste of Manchester Three Weeks Away! The 8th Annual Taste of Manchester is only three weeks away. On Tuesday, May 9 from 5:30-9, participants will sample a variety of foods from Manchester's eateries in this popular pub-crawl style event. Tickets for the event tend to sell out, so go to the TOM WEBSITE where you can sign up as a volunteer, get more information and buy your tickets today. 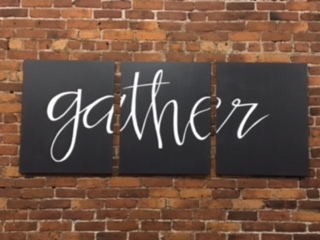 This year's Taste of Manchester is less than a month away, and our first featured participant is new to town, having celebrated their Grand Opening on April 7 of this year. That new business is Pagano's Italian Market, now open in the front of the Strano's Bakery building on Broad Street. Strano's Bakery is no stranger to Manchester. A commercial wholesale bakery famous for their grinder rolls, Strano's has been in business over 35 years. Bill Pagano has been friends with the owners of Strano's longer than that, so when the opportunity to take over the retail space at the front of the bakery building came about, Pagano jumped at the chance. His grandparents and parents were in the restaurant business in Italy, and he and his wife always hoped to have a small Italian place of their own. Pagano's Italian Market is more than the name implies. Yes, they offer Italian specialty products for sale, including olive oils, pastas, and sauces, to name a few. But they also consider themselves an Italian deli, bakery and cafe, and they sell entrees, grinders, soups, salads and desserts. Everything is made fresh in-house including their famous meatballs and a variety of Italian cutlets (beef, chicken, eggplant). Their thick sheet pizzas, giant grinders and stuffed breads are perfect for parties. They also accept orders for catering. The space is open and well-lit with plenty of tables to enjoy their delicious offerings on site. In one corner is an Italian espresso bar, in the other, a case filled with Italian meats and cheeses. In the middle there is a bakery case filled with a variety of Italian cookies and pastries. Crisp cannoli shells are filled to order with a light, fluffy cannoli cream, perfect to enjoy with your cappuccino or espresso. Manchester's newest business offers something for everyone. From antipasto to zuppa, eat-in or take-out, Pagano's Italian Market has it all. They are located at 255 Broad Street, and are open Monday-Friday 10-7, Saturday 10-4, and closed on Sundays. Their menu and more information can be found on their Facebook page, and of course, they will be serving up goodies at this year's Taste of Manchester. Tickets are on sale now! Sometimes Mardi Gras sneaks up on you. You wouldn't think so, as it is a set day every year - the day before Ash Wednesday, 46 days before Easter, and the whole Mardi Gras season actually starts on Three Kings Day (January 6) so, again, you think you'd have time to plan. Well, Mardi Gras snuck up on us. 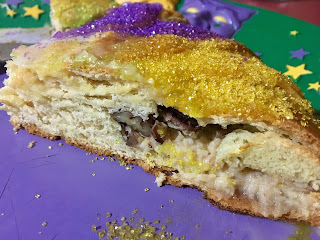 We managed to (barely) get our crawfish order in on time to have them delivered on Fat Tuesday, but the king cakes were outrageously expensive, if not sold out entirely. Amy hemmed and hawed and finally came up with a plan, inspired by a can of Pillsbury Crescent Rolls in the fridge and the vague memory of making some sort of stuffed holiday wreath appetizer with them at someone's Pampered Chef party years ago. This particular version is simple enough to be worthy of the Big Easy itself, where King Cake rules tables in office lunch rooms and teacher lounges for the first two months of the year. Someone starts by bringing in the first cake, and the person who finds a plastic baby in their slice gets the dubious honor luck of bringing in the next one. Needless to say, King Cake has ruined many a New Year's resolution. The colors of Mardi Gras have meaning, so remember that when you are decorating - purple stands for justice, green for faith, and gold for power. And don't forget to put a plastic mini baby doll (or dried kidney bean) somewhere inside for luck. 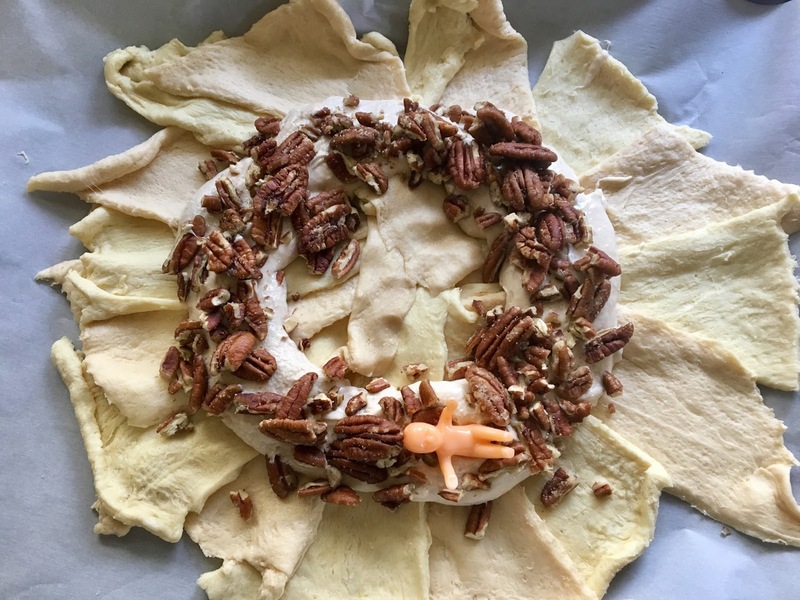 If Mardi Gras snuck up on you, too, you still have time to grab a few ingredients and make this quickie version before midnight rolls around. Happy Mardi Gras! Laissez les bon temps rouler! 1. Line a baking sheet with parchment paper and preheat oven to 350F. 2. 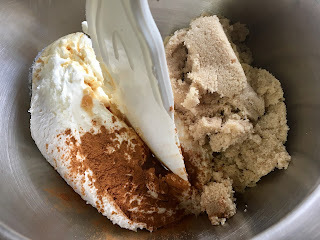 In a large bowl, stir together the cream cheese, brown sugar, 1 teaspoon of the vanilla, and the cinnamon until well-combined. 2. Unroll each piece of dough in a circle with the flat sides of the triangles on the outside of the circle and the pointed ends of the triangles in the center of the circle, slightly overlapping each other. 3. Spoon the cream cheese mixture about half way out, then sprinkle with the chopped pecans, if using. Place the baby somewhere on there. 4. 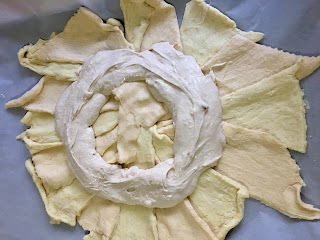 Flip each piece of dough over the cream cheese mixture and press on it the seam in the center so it doesn't leak out. 5. Bake at 350F for 30 minutes, until golden brown and allow to cool completely. 6. 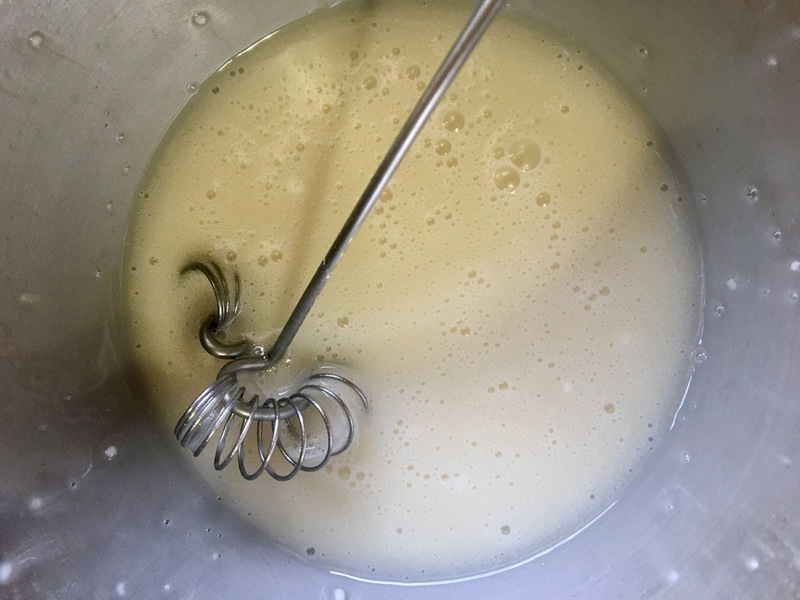 Whisk together the sugar, milk and remaining teaspoon of vanilla to make the glaze. Spoon the glaze over the cooled cake, allowing it to drip over the sides. 7. While the glaze is still wet, decorate with purple, green and gold sugar.